The Reef Run Slot by Yggdrasil is a five reel slot with three rows and 20 fixed pay-lines. The set is an underwater kingdom and your reels are in the foreground. Similar to Betsoft Slots the Reef Run Slot also has animated 3D symbols. From 20p up to a maximum of £100 you can spin the reels. The main goal is to trigger the Free Spins feature, because here you can grab the biggest winnings. You can get up to 60 free spins with up to 20x multipliers here. Symbols and Payouts: The Reef Run Slot has only themed symbols which are of course all kinds of underwater animals. Brightly colored crab, lobsters, sea snails, sea horses and octopuses land on your reels. The big green fish is your most valuable symbol and pays you 1000x your bet when combined with 5 symbols. Unfortunately, there is no wild symbol at Reef Run Slot, but a Free Spins Scatter symbol which triggers the main feature. Free Spins feature: The Free Spins feature is the main attraction at Reef Run Slot. You must land at least 3 Free Spins Scatters on your reels to trigger 10 Free Spins. With 4 Free Spins Scatter you get 20 Free Spins and if you manage to even grab 5 Scatter symbols, it’s an incredible 60 Free Spins. Every win in the Free Spins feature will be rewarded with a Level Up Multiplier. In this way you can get up to 20x winning multipliers. With 2 Scatters in the Free Spins feature you can get 2 free spins each. Reef Run and Golden Bet: The only additional bonus game besides the Free Spins feature is the Reef Run Bonus. You activate the reef run in the base game with the Golden Bet. You then play each round with an additional bet and have the chance to win a top prize of £25.000 in the free spins feature. Before the Free Spins start, choose one of the sea animals. If your see animal earns the most points in the Free Spins feature, you will receive an instant cash prize of up to £25.000! 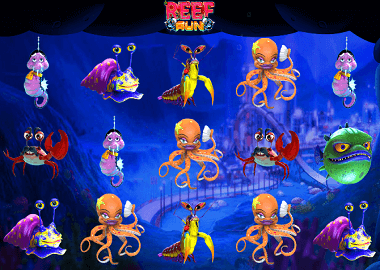 The Reef Run slot is a very good game, which is primarily about the free spins. Yggdrasil Gaming is known for its unconventional slots with fast game play. You can play the Reef Run Slot here for free by clicking on the banner above. You can find more free Yggdrasil Slots in our Yggdrasil Gaming review. Below in the table you will also find UK Casinos with Yggdrasil slots. You can redeem an exclusive bonus at Casino Cruise! Play there with 55 free spins without deposit after your registration.